Santas on the Run will be returning to the Eden Project on Sunday 9 December 2018! Run, jog, skip or walk your way around our festive fun 2k course. Join us in our event village from 9.30am (the race will begin at 2.00pm) to make the most of the Christmas festivities before you run. Face painters, tombolas, entertainment and music will welcome you and get you in the Christmas mood. There will be food and refreshments available to fuel you so don't forget to bring some festive gold coins to spend! Our volunteer photographers will be on hand to capture all the fun of the day. Your event registration fee also covers the cost of entry into the Eden Project which makes it a brilliant festive family day out. Dazzle us with the amount you raise and you could win a prize! The sponsorship you raise for taking part in Santas on the Run will be a huge Christmas gift to our families and as a thank you for your hard work, we’ll be giving prizes for your efforts, so please get fundraising! Our Santas on the Run competition is a free prize draw for any adult who raises over £30 sponsorship, and any child who raises over £20 in sponsorship by the closing date of the competition. The adult prize is a Christmas hamper and the child prize is free entry to a local attraction. Your sponsorship will help to support the vital work of Children’s Hospice South West. If you'd like to find out more about this event just click the 'ask a question' button to send us an email or give us a call and we'll be more than happy to help. Save yourself the hassle of collecting your sponsorship money. It's quick, easy, secure and the donations will come straight to us. 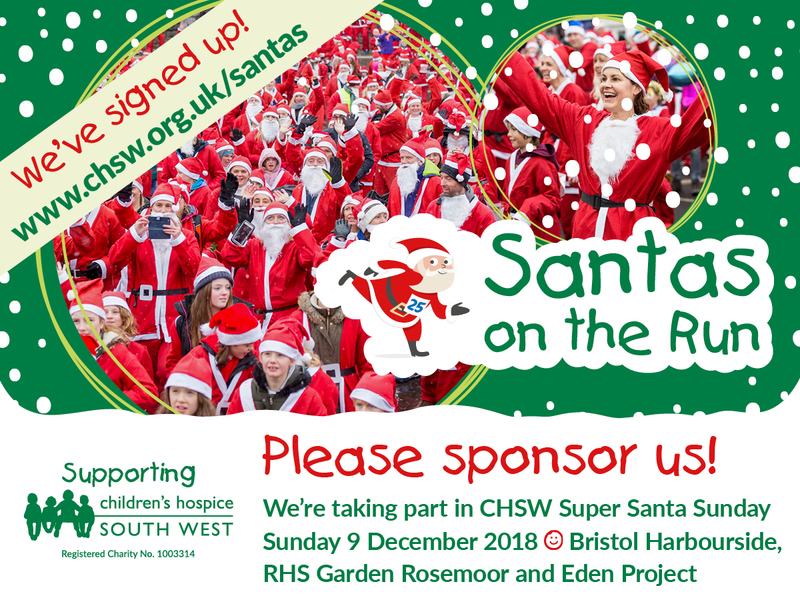 Experience CHSW's Santas on the Run! Video of Experience CHSW&#039;s Santas on the Run! The Eden Project is an educational charity which connects us with each other and the living world, exploring how we can work towards a better future. Ocean Housing is a not for profit, charitable registered provider of social and affordable housing throughout Cornwall.